The first young woman in her tiny Belizean village in the Toledo District to go to college as well as one of the first to go to high school, Higinia Bol, SCN, recalls how others responded to her when she dared to gently question her elders as to why girls weren’t encouraged to go to school beyond eighth grade. As a woman of fierce determination and powerful insights, linked in large part to her village roots, it’s that same determination that is fueling Sister Higinia in her latest ministry. She sees possibilities in everyone and is determined to use her personal experiences to empower women, many of whom remind her of where she might have been destined to land had she not found her voice. Sister Higinia is part of the grassroots nonprofit organization in Belize City, Belize, the Center for Community Resource Development. The nonprofit is reaching out to residents who live on the south side of Belize City and bringing about dramatic improvements. Described as being among the poorest areas of the city, Sister Higinia says the community is often marginalized by people living in other parts of the country who sometimes look down upon and make snap judgments about “that section.” She shares how the residents sometimes run into discrimination when applying for jobs based on their address. Indeed the south side of Belize is a community grappling with unemployment and an increase in crime. Residents often feel hopeless or unable to bring about change. However, Sister Higinia speaks out about focusing on the many positives of that area including the strong sense of community and the way neighbors go out of their way to help out one another. And she says, that is what she hopes to inspire others to see…the possibilities. Sister Higinia and Rev. Brian Christopher, SJ, are determined to help the residents help themselves. The nonprofit’s goals are two-fold focusing on social and economic development. Sister Higinia has been meeting with residents asking them to identify the resources in the community that already exist and to tap into individual resources as well. It’s all about focusing on the positive and building on strengths says Sister Higinia, and changing the mind-set of folks who have lived on the south side for generations. A number of initiatives have already taken root including a program called “circles of conversation” involving a group of women that exhibit leadership skills and a history of being advocates. These women come together to brainstorm and plan, and in turn invite others to join them in making the community stronger and more forward thinking. In just a short period of time, several changes are taking place, like the back yard gardening program. Many residents in the south side are struggling to have enough food. They don’t realize the possibilities of gardening in their own yards and neighborhoods, thinking that crops grow only in more rural settings. With guidance and instruction, these families are now learning how to grow their own food, generating a bounty of vegetables in order to feed their own families and others around them. A skills training program is also taking off. Folks who prepare traditional foods representative of the Belizean culture are working with experts in the hospitality and tourism industries to perfect their foods and to market these tasty treats to tourists. It is a win-win program as the women are engaged to help preserve Belize’s traditional foods, and at the same time, they earn an income doing something they love, using skills they already have but that just need to be further developed and honed. Sister Higinia’s life is a testament to that mind-set. At a time when no young women were going on to high school, she and three friends convinced their parents to let them further their education, a sacrifice that meant they had to leave their parents and friends behind, because the school was some distance. Sister Higinia then dreamed of college and convinced her parents to let her explore possibilities, despite their trepidation about her going away to school. She went on to win a scholarship to a college in Arkansas and left Belize for the U.S. where she earned her degree. She continued to dream, this time of finding a way to help even larger groups of people. Sister Higinia found herself drawn to the Sisters of Charity of Nazareth. 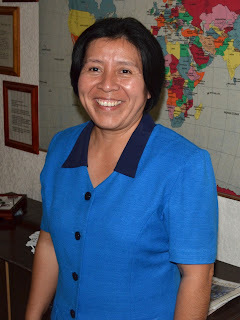 And now, after going to high school and college, making vows as a Sister, and having a fulfilling career teaching in Belize, Sister Higinia is in a new ministry, that of community development. She considers herself very blessed having been able to pursue an education and to travel many places, but Sister Higinia will be the first to say, she still she sees herself as the young woman from Toledo. She also says she sees herself in the women of the south side of Belize, adding she hopes others now believe … nothing is impossible.